This romantic beachy look, created for Luxe Linens' Los Angeles launch, took us back to the early 1920s. We worked hard to harmoniously combine vintage elements with today’s unique design standards. Located in the Bel-Air Bay Club along the shores of Pacific Palisades on PCH, our venue was rich in history and equally gifted in beauty. 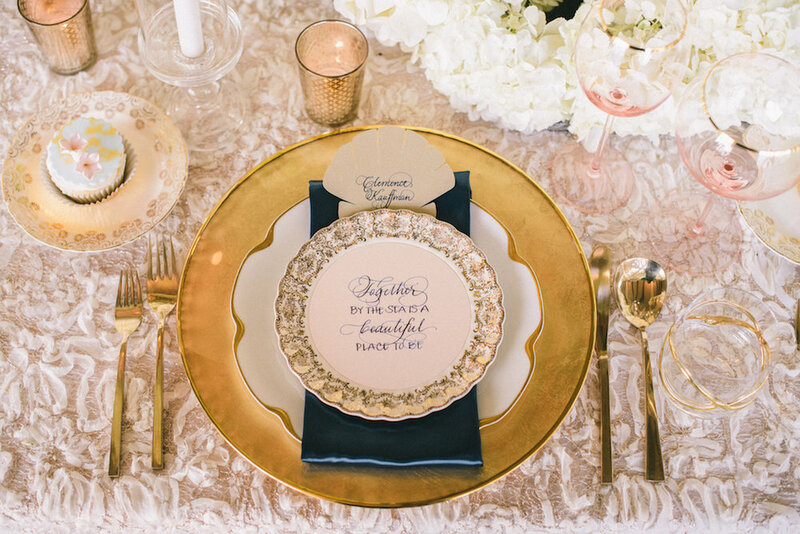 The linen used for this event was the beautiful and timeless Monaco Ivory and Gold. There are so many wonderful little details about this event that continue to dazzle and excite our team! The windows along the back wall of the venue were draped in beautiful ivory fabric courtesy of the talented team at Revelry Event Designers. White and ivory clustered floral cuffs were used to tie back the draping (I know, we don't have images of them specifically- but they sure were gorgeous!). Guests were pampered with Revelry’s incredibly chic Infinity chairs with ivory cushions. The event was staged for silent film actors and actresses, some of whom may have visited the Bel Air Bay Club in its day and age. 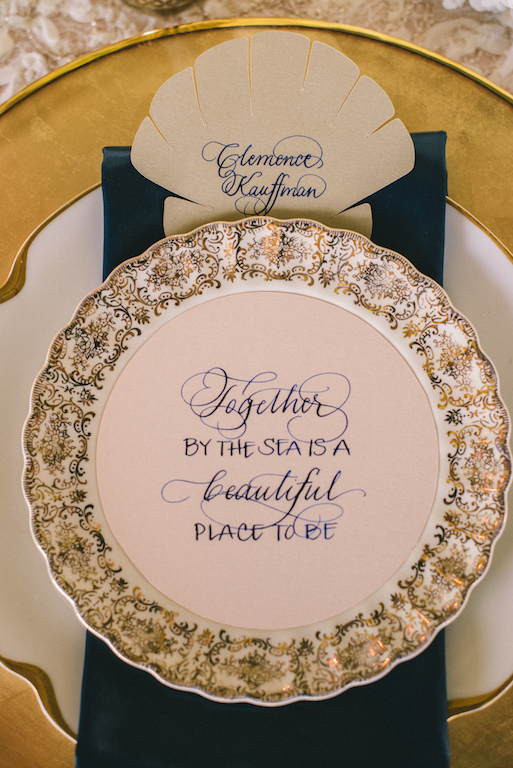 Their names were elegantly written in a dark navy ink- all thanks to the amazing talents of Katrina at Calligraphy Katrina! Let’s not forget about the beautiful small chandeliers which hung off of the wave, illuminating and softening the design simultaneously. Even softer lighting came from our ivory taper candles placed atop gold taper holders in shimmering glass chimneys. Assorted golden votives were then scattered carefully throughout the design.simultaneously. Even softer lighting came from our ivory taper candles placed atop gold taper holders in shimmering glass chimneys. Assorted golden votives were then scattered carefully throughout the design. These beautiful images from both Krista Mason Photography & Weintraub Photography showcase our wave structure in an amazing way- but I'm not sure that any image can portray just how massive and breathtaking they are. When fully put together, one of them will take up nearly an entire wall of our warehouse. This design commands attention from all those treated to it. We love how it continues to take designs and color schemes to new heights (literally, it's pretty tall)! A very special thank you goes out to all of the amazingly hardworking vendors that teamed up for this event!